I’ve come to an important conclusion recently. If you can’t beat winter, you might as well make the most of it and have a little fun. Sure, this winter has been particularly cold and snowy, but that doesn’t mean we can’t take advantage of said coldness and snowiness for some good winter fun. So I decided to embrace winter wholeheartedly, and, surprisingly, it’s been pretty great. Between cross country skiing, an excursion to an actual igloo on Lake Monona, outdoor tailgating and watching a pretty fantastic ski jumping tournament, I’ve been pretty busy. This weekend, I’m going to learn how to curl. So, yeah, as it turns out, winter can be pretty fun. Of course, a day of wintry activities is even better when you can return home afterwards and dig into some delicious food. Because, let’s face it, no matter how much fun you’re having outside, it’s still absolutely freezing. And some warming sustenance is just what you need in this sort of situation. One of my favorite things to make after a cold day of skiing or hiking on frozen lakes is a big bowl of noodles. Not only is pasta quick and easy to make, but after a cold day outdoors, it’s wonderfully filling and delicious. And this version, with mascarpone, fresh spinach, and lemon is no exception. And did I mention it also has a nice crunchy topping of warm garlicky breadcrumbs and parsley? Yep, that will make you happy. 1. Coat both sides of bread slices with 1 tablespoon of olive oil. Cut garlic clove in half and rub cut sides on both sides of each slice of bread; reserve garlic clove. Place bread on a foil-lined baking sheet on the top rack of the oven, and turn on the broiler. Broil bread, flipping once, until both sides are golden brown and crisp, about 2-3 minutes per side. 2. Place toasted bread, reserved garlic clove, and parsley in a food processor and process until crumbs are formed, about 20-30 seconds. Set breadcrumb mixture aside. 3. 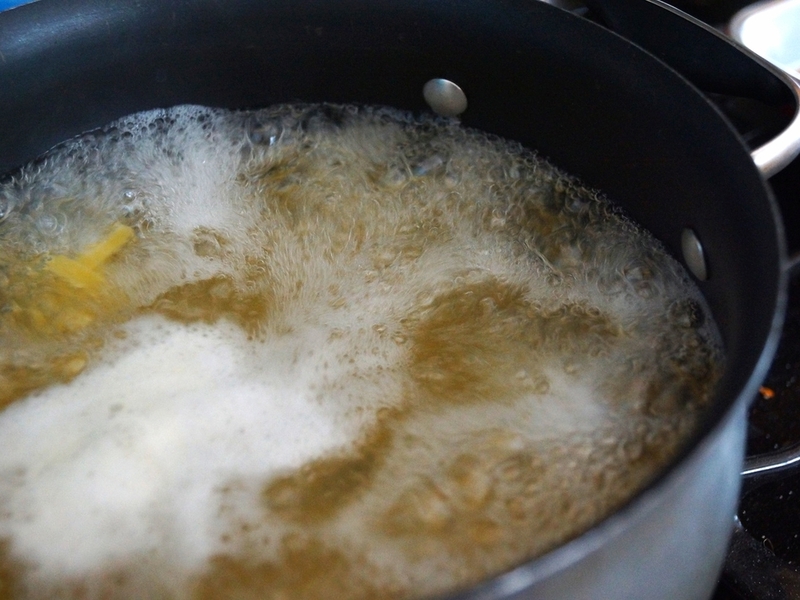 Cook linguine in a large pot of well salted, boiling water until just past al dente - about 8 minutes. Drain, reserving ¼ cup of the cooking liquid. 4. In a large bowl, combine the mascarpone, lemon zest, salt and pepper. Add the hot linguine and reserved ¼ cup of pasta water and mix until mascarpone is melted and coats pasta. 5. Heat remaining 1 tbsp olive oil in a pan over medium heat, add spinach and red pepper and cook until spinach is just wilted, about 2 minutes. 6. Add spinach to pasta, mix to combine, and season to taste with salt and pepper. Top with bread crumb mixture and serve immediately.